"Why is English so popular"
Гипермаркет знаний>>Английский язык>>Английский язык 8 класс>> "Why is English so popular"
1 Organize a discussion. Don't forget to use the phrases from Conversation bricks. In the end your group should have an answer to the question under discussion. You are Mr (Mrs) Brinks, a rich American businessman. You think that English is so popular because it is the language of America. The world has to understand America because it is one of the biggest and strongest countries. Everybody wants to do business with America. Illustrate your position with these ideas. 1. Six out of ten richest people in the world are Americans. 2. The whole world eats in American restaurants: McDonalds, Burger King and Pizza Hut. 3. The whole world wears American jeans such as Levis ['li:vaizj. 4. Hollywood is the biggest film producer in the world. The most popular films in the world are American. 5. The dollar is the most popular currency (валюта) in the world. 6. The USA is the world leader in science and technology. You are Mr (Mrs) Belov(a), a Russian translator. You think that English is so popular because it is very easy. Use Misha's or your classmates' arguments. You are Mr (Mrs) Bamridge, an English historian. You think that English is so popular because it has words from other languages. It is like many European languages and that's why people can learn it easily. Use this information and facts from the text as examples. Scandinavian words in English: anger (гнев), cake, call, egg, get, give, kick, kill, score, scrub, seat, skill, skin, skirt, sky, take, they, them, their, ugly, want, window, husband. Latin words in English: street, kitchen, cup, cheese, wine, angel, wall paper. French words in English: country, court (суд), crime (преступление), prison religion, prince, princess; royal, adventure, change, fruit, letter, literature magic, male, female, mirror, question, special. In fact, English is a Germanic language. The Anglo-Saxons contributed tc the formation of English most of all. English grammar is still very similar tc German. 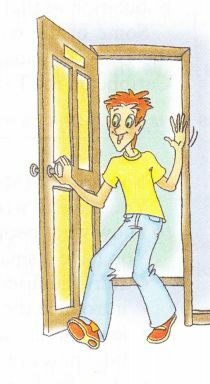 There are also a lot of French words in English from when Willian Duke of Normandy became the King of England in 1066. You can find a lo of Scandinavian words in English too. They came from the times when the Vikings raided Britain. The English alphabet came from Latin. Christiar monks, who spoke Latin, brought it to England from Ireland. It is very strange, but the Celtic language didn't contribute many words tc modern English. We can only find Celtic words in the names of places and rivers such as Dover, Kent, Avon and the Thames, for example. You are Mr (Mrs) Swarup, an Indian student. You think English is so popular because the United Kingdom used to have a big empire. The British had colonies all over the world, and all the people in the colonies had to speak English. Your country, India, is an example. Look at the text and the map. Use the map and the facts from the text to support your ideas. The beginning of the British Empire ['empaia] was in 1583 when Queen Elizabeth I sent her ships to explore new lands and continents. The expeditions were always successful. More and more lands became the part of the British Empire. At that time Doctor Dee, the Queen's magician and astrologer, said the famous words: "British Empire". He was right. 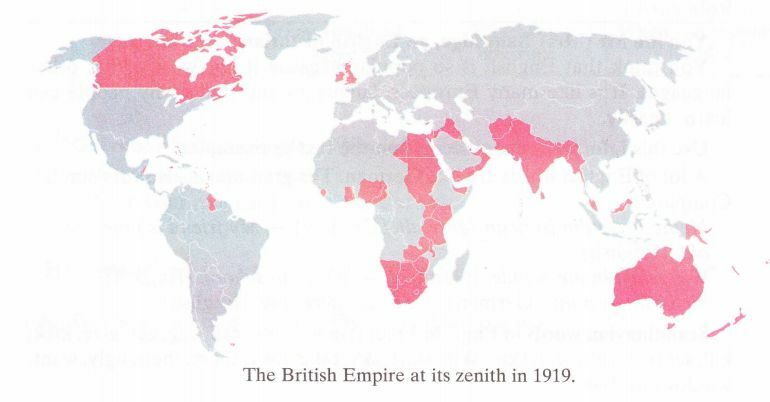 Britain had the largest empire in the world. People said about it: "The sun never sets on the British Empire." It was true: the empire was so big that it was always daylight in some part of it. Its territories were on every continent and ocean. By the beginning of the 20th century the British Empire had a population (население) of 400-500 million people (about a quarter of the world's population at that time), and covered about 30 million square kilometres. Some of the countries that used to be British colonies or territories are: the USA, Canada, Australia, New Zealand, India, large parts of Africa, the Caribbean, the Far East, the Middle East and some islands in Europe. You are Mr (Mrs) Forbes, a Canadian journalist. You have to write an article about the English language and you want to know what people from different countries think about it. Mr (Mrs) Bamridge, an English historian. Mr (Mrs) Belov(a), a Russian translator. Mr (Mrs) Swarup, an Indian student. 2 After next lesson at home write an article "Why is English so popular?" А Read the conversation and answer the question: Who is the robber? Mark: I've spoken to Andrew. He agreed to help. He'll write a special virus that will dodge the filters of the hotmail system. This virus will destroy the robber's computer i in two hours after he opens the e-mail. Misha: That's good. When will Andrew be ready? Mark: He promised to send the letter with a virus this evening. Rob: So if we're lucky, we'll catch the robber tomorrow. Rob: Wake up, Misha. We must hurry! Rob: Andrew has just called me. Your plan worked. Mark: You'll never believe it. Half an hour ago a girl we all know came to Andrew with her laptop. She was crying because her laptop didn't work at all. Misha: A girl? What girl? Rob: It was your friend, Emily Wilson. Misha: Emily? I can't believe it. She's our friend, Rob. (чинит) her laptop. Let's go and check her room, find something there. Misha: I'm not going anywhere. I'm going to bed.